I didn’t plant any red tomatoes. Sure, a few romas from last year’s plantings volunteered their services and we have a few from our CSA, but most of mine are heirlooms. Yellow, Black Prince and, of course, Mr. Stripey. I didn’t think about that when I started to make salsa to can. The only red in the mix comes from the mild red peppers and a few tomatoes from our CSA. It’s such a colorful blend of peppers, onions, tomatoes and cilantro…quite pretty actually. Before starting, I looked at a few salsa recipes in the Ball Canning book and on Pinterest. So many sounded delicious! 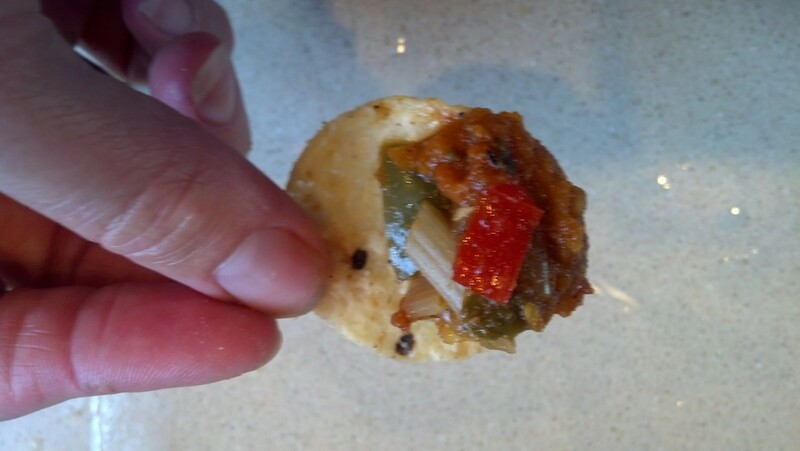 I decided to take the best flavors from several recipes to make my own tasty salsa. I pulled quite a bit of the ingredients below from the garden, but I did end up having to get some at the store. Oregano, chili powder, salt, pepper, worcestershire sauce, garlic powder and lime juice for the jars. I later added cumin. Cilantro, Italian red and green peppers, leeks from CSA, tomatoes, jalapenos, red onion and garlic. My father-in-law is a great cook. He makes up marinades for pork, chicken, beef, veggies, you name it. They are so tasty…the perfect blend of flavors. I’ve watched him cook and asked him how he knows how much of this or that to put in. His response? Season it until it feels right. I started to do the same. At first, I was conservative with my seasoning. I was too afraid I would over season and sabotage the dish. In fact, I did ruin dishes a couple of times with too much salt or pepper*. *Note: You don’t need to use as much pepper and salt if it is finely ground. Then, as I cooked more and marinated more, I got a better sense of what tastes good together. So when I made this salsa, I didn’t really use measurements. I used two full bulbs of garlic plus more garlic powder, some oregano, a little chili powder, probably too many jalapenos, 3 or 4 pounds of tomatoes, a few leeks, two red onions and then two cans of stewed tomatoes that I crushed. I prepped and put all of the ingredients in a stock pot and put it in the fridge overnight. I told myself it was to let all the flavors “mesh”, but really, I was just tired from all of the chopping, mixing and crying over the onions and leeks. I mixed it all up the next day and cooked it on the stovetop. I tasted it several times, adding a pinch more of this or that until it was to my liking and knowing that as it sits in the jars, the flavor will only get better. 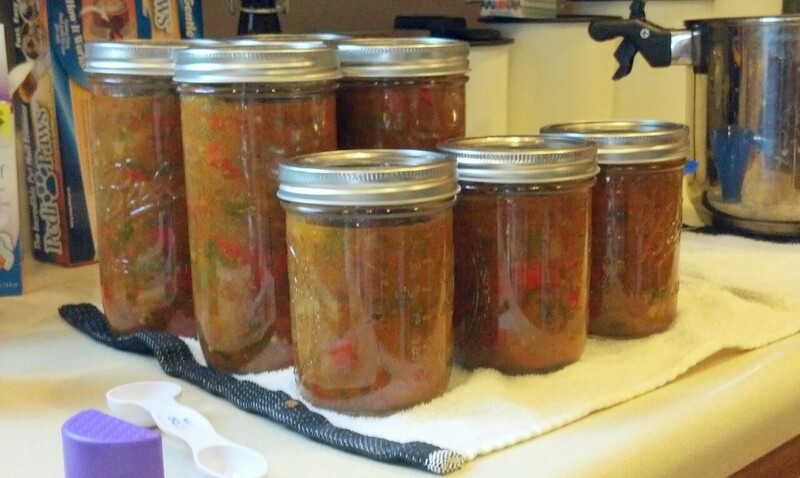 Then, I sterilized the jars, rings and lids, ladled the hot salsa into the hot jars, and processed for 10 minutes. I ended up with 4 quarts and 3 pints. Enough for us to enjoy, and share. Customary haiku for my amusement. This entry was posted in Canning, Food, Writing. Bookmark the permalink.